CO2 Fractional Laser Treatment in Lima with our English speaking Dermatologist is considered the most effective laser for combating wrinkles, aging, acne scars, regular scars, mole removal and many other skin imperfections. By using DEKA’s latest laser technology, treatments are performed in total safety, without any undesirable side effects and with drastically reduced recovery times. The CO2 fractional laser treatment now makes it possible to perform any treatment on the face, neck, and hands in total safety, even in very delicate areas such as the eyelids. It is also possible to reduce furrows of deep wrinkles and totally eliminate shallower ones, too. During the process of removing imperfections in the skin, it is important to know that your skin is completely protected by DEKA’s advanced technology. How Does a CO2 SmartXide 2 Dot Laser work? The laser-induced re-epithelisation process in the treated area stimulates the dermis to produce new collagen. New skin will appear more elastic and much smoother, without any scars or alterations to your natural facial characteristics. 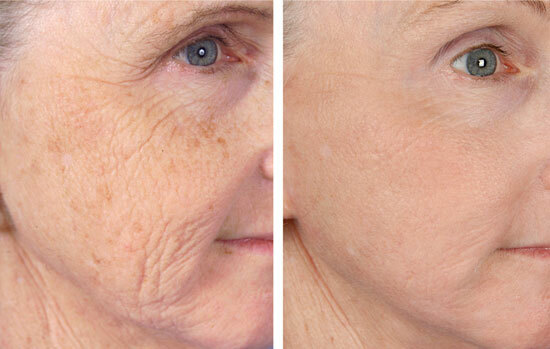 The advanced CO2 fractional laser treatment produces light at 10,600nm which is absorbed by water in the skin tissue. The laser heats the water causing the evaporation of the affected tissue. The deep skin layers are stimulated which form new collagen and it is this that helps skin appear smoother, younger and problem free. ”Some patients prefer to treat only a fraction of the skin surface with each session, instead of removing all of the outer layers of skin in one go. The CO2 fractional laser treatment results in less injury to the tissue and therefore gives faster healing with less risk of scar or pigment damage. In exchange for this less aggressive treatment, it is normal to not see as much correction as with one, longer treatment. However, treatment plans are designed with the patient’s wishes and expectations in mind. ”I am Karen, age 70. I would like to share my experience of having fractional CO2 laser treatment skin resurfacing done by Dr. Renzo Hurtado with those who are considering this procedure. I hope it will be helpful. ”Before I decided to do this, I watched lots of videos of people who had had it done. Some were positive and encouraging. Some were downright terrifying! I also researched online the brand of the laser machine that Dr. Hurtado uses…and found it was the top of the line in fractional CO2 lasers. ”My first contact was with Lloyd, Dr. Hurtado’s office manager, who very patiently answered all my questions by email…and I had a lot of questions! I was quite impressed by the completeness of his answers, his friendly and professional attitude and by his almost immediate email responses. ”Then, I made an appointment for a consultation with Dr. Renzo Hurtado and I asked him all my questions. He answered each of them thoroughly, patiently, and very honestly. He walked me through each step of the procedure as well as the recovery process. By the time I made up my mind to do this, I was nervous, mainly because I have a low pain tolerance, but I was not afraid of anything else. ”Before the procedure, my face was numbed with numbing cream. I had originally asked Dr. Hurtado if I could also have something additional for the pain…and he said he would give me a light sedative if I needed it. That was my ‘safety net’, but as it turned out, I didn’t need it. I could feel the pain (sensitivity really), but it was not intense. The weirdest part was that when he used the laser on my eyelids, I felt it in my feet!! That was strange. ”After the procedure, he put 2 kinds of creams on my face and gave me instructions on how to take care of my face for the next week. A follow-up appointment was scheduled for one week after the procedure. ”I did experience the throbbing and the “sunburn” feeling after the procedure, for which Dr. Hurtado had prepared me. Originally, I had planned to stay at the office until these symptoms passed (usually about 1-2 hours), but they were very mild, and so I felt comfortable to leave right away after the procedure. Other than during the procedure, I really had no pain! ”That was a very happy surprise. ”I was expecting to be beet red the next day, but I wasn’t. I had redness, but it was not extensive at all. So, I thought it would be redder the next day… but it wasn’t. It stayed pretty much the same shade and lessened as the week went on. I was very surprised that the healing process was actually no big deal; I had prepared myself for the worst after watching so many videos online of CO2 fractional laser treatment. In addition, from the videos online, I expected day 5 to be awful, the worst day, but it wasn’t. The third day was, and it wasn’t bad at all, just more dead skin flaking off that day than on other days. By day 7, all the dead skin was off except for one little place, and by day 8, it was gone, too. ”I had a lot of wrinkles, some very deep. I still have wrinkles, but they are much less deep. And happily, some wrinkles disappeared entirely. This was the outcome that I expected, and I am very pleased with the results. In many of the videos that I watched, quite a few people said they would not do this procedure again. But for me, I would definitely have it again, as long as I can have Dr. Hurtado do it, and I have already talked to him about doing it again in a year. He said that doing it a second time will remove most of the remaining wrinkles. I have great confidence in Dr. Hurtado. ”He was very careful, gentle and professional. He explained everything very carefully and in detail, which was, for me, extremely important. The fact that he trains other dermatologists in this procedure, says a lot about his skill. ”I took an injection of vitamin C on the day of the procedure. I think this may have speeded the healing process. I also told Dr. Hurtado that I wanted to pray before he began the procedure. Since all healing comes from God, I want to acknowledge and thank my Heavenly Father here, for my healing. Angeles, CA. I want to require for the price of Fractional CO2 laser. We have replied privately by email. Hello Ana. We’ll email you today. Cheers!